When you’re out there on the footpaths, do you smile? When your feet fall into the rhythm, one after another, do you smile? When the person running towards you has a grimace of pain and determination on their face, do you smile? When the person running towards you nods their head in your direction, do you smile? The runners smile. The nod. The acknowledgement. A shared understanding of so many things. A shared moment. And every time I see someone running towards me I want to smile. I want to say “how awesome are we right now for being out here and running?!”. I don’t know their story. I don’t know what race they are training for. I don’t know if they’re just running for fun. I don’t know how many years they’ve been running for. I don’t know if they have been out there for 10 minutes or 2 hours. And they don’t know any of these things about me. 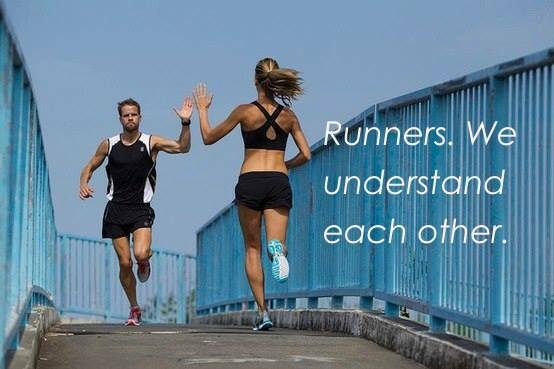 But when a fellow runner looks up and smiles it can mean the world. It can mean the difference between me stopping running because “i feel exhausted” and finding the mental strength to keep going despite what my legs are telling me. It can be the difference between me getting down on myself for not running as fast as I want to and feeling on top of the world because I am a runner, we are runners and we’re all out there. Do you smile? Today a lot of my fellow runners smiled. Perhaps more than ever before. And maybe that’s why my run felt so good. Even when I’m so tired from running that my mouth has forgotten how to work and I accidentally create a big spit bubble as well as a grin, I always try to smile. Because when you’re out there pounding the pavement alone, it’s nice to know that someone else is out there and for that brief exchange, they’re with you.